Here is a render of Kalan de Araw. It collect light energy or photon energy radiated by the sun and focus at the pot. With these type you could save your money for cooking. It will cost you USD 30 only to actually build these KDA. Tools are soldering iron 100 watt, steel sheet cutter. Go to welding shop for the arms and legs construction. Put weight on legs and wire on arm if wind is blowing hard. Your electric bill will be low on summer. Cooking rice: add rice on the boiling water which twice the volume of rice. wait 30 minutes to cook the rice. The reflector is compose of 5 pieces cut stainless steel mirror surface sheet welded (the thin blue horizontal line) or braze together to form a parabolic reflector (strips is a cone strip from analytic geometry), or a composite of Galvanize sheet and aluminum foil. the reflector can be rotate vertically and fix by the loosening and tightening the lock nut. It can rotate horizontally at PIVOT. 2 arms and pot holder are welded together. the 4 legs are welded to the pivot pipe. Kalan de Araw is actually 3 pcs, the reflector to arm by lock nut, insert arm and pot holder to pivot with leg. you could put weight on the leg and tie the reflector during wind storm. 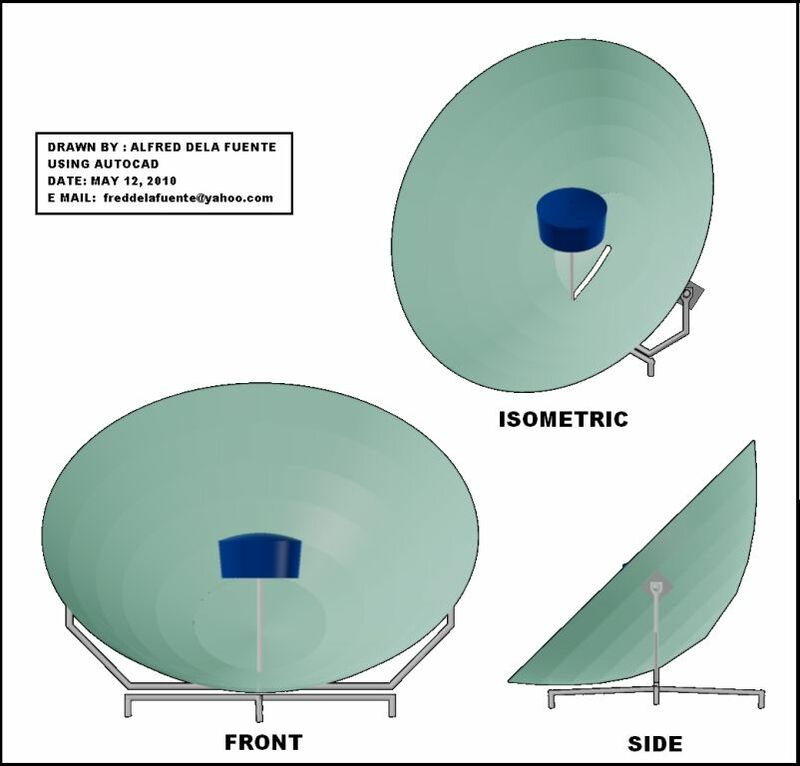 The reflector could be easily rotate at a 3 axis because the center of gravity is approximately at the focus of the reflector and where the photon is concentrated. Put your black pot with your favorite dish on the pot holder and focus the photon rays you collect from the Sun. after 45 minutes it is done. be sure there is plenty of sun rays (photon or light rays). Hope you gain even a little in me these can only means a lot, really really lots. you know right.